The Free Video Flip and Rotate is a handy piece of software that allows the users to alter the orientation of video clips. This free software tool can also be used to convert videos to various other formats such as MOV, FLV, MP4, AVI and MPG. It has a simple and user-friendly interface with a plain window. The Free Video Flip and Rotate software tool is quite simple to use and the conversion process is completed in a jiffy. The user interface has a set of controls which can be used to flip and rotate the videos. Although there are a number of control features, it is quite easy to operate these switches. The program allows the users to select the files with a file browser. However, this free software program also supports drag and drop method. The Free Video Flip and Rotate software program also supports batch processing and therefore users can rotate the videos and convert multiple files simultaneously if required. This free program displays the original format and the full path of the file during the conversion process. This software tool has no help file but it has a detailed user guide in the website. 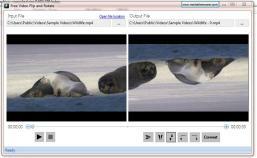 Users can easily flip and rotate the video clips with the use of this freeware tool. The Free Video Flip and Rotate software program allows the users to flip the video clip vertically and horizontally. It is also possible to rotate the clips clockwise and anti-clockwise. Users can select the output extension, output directory and the rotation mode before initiating the process. The program allows the users to disable the rotating feature and use only the conversion tool. It is also possible to disable and enable sound reminders. The Free Video Flip and Rotate software program is known for its overall simplicity and ease of application.